The Tradition of the Elders, based on Matt 15:1-20 and Mark 7:1-23, explores how the oral law upheld and promoted the anti-Christian forces of Pharisaism and Sadduceism. As such, they appear repeatedly in the New Testament documents, often as ""the law"" and ""the works of the law."" For example, consider: - ""When Gentiles who have not the law do by nature what the law requires, they are a law to themselves, even though they do not have the law"" (Rom 2:14). - ""We ourselves, who are Jews by birth and not Gentile sinners, yet who know that a man is not justified by works of the law but through faith in Christ Jesus, even we have believed in Christ Jesus, in order to be justified by faith in Christ, and not by works of the law, because by works of the law shall no one be justified"" (Gal 2:15-16). - ""Tell me, you who desire to be under law, do you not hear the law?"" (Gal 4:21). But which law do these legal references concern--the Torah, the oral law, or the Decalogue? This important distinction between the oral law and the Ten Commandments is what The Tradition of the Elders sets out to make clear. All New Testament exegetes, including teachers and students, can benefit from an increased understanding of the enmity of the oral law against the Gospel. ""Reading a draft of this book I was impressed by the way it is laid out and the way in which it is presented, not just for professional people."" --Walter John Norman, New City Church, Brantford, Ontario, Canada T. Hoogsteen has served in parish ministries for twenty-five years. Currently, he writes for covenantstudies.com and several other publications. He holds degrees from Calvin College and Calvin Theological Seminary in Grand Rapids, MI, as well as De Theologische Hogeschool van de Gereformeerde Kerken, an institution now amalgamated with Amsterdam's Free University. 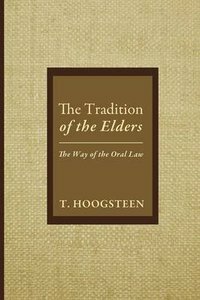 About "The Tradition of the Elders: The Way of the Oral Law"